This highly regarded 4-star hotel can be found adjacent to Stukley Meadows Industrial Estate on the western fringes of Huntingdon Town Centre. Convenient access to the A1.. 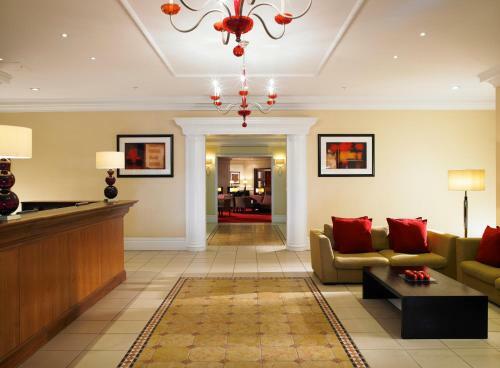 The Huntingdon Marriott Hotel sits on the outskirts of Huntingdon and boasts excellent transport links. A wide range of modern facilities are offered including indoor swimming pool, steam room, whirlpool and state of the art leisure gym (with 24-hour access). For a small fee you can also enrol in our fitness classes. Guests can enjoy a delicious meal at Brooke's in a contemporary setting and enjoy some tasty international dishes. Free wi-fi is also available. All of the guest rooms feature comfortable bedding, custom duvets and cotton-rich linen. You also have a 32-inch, LCD, flat screen TV with freeview and pay-per-view movies to keep you amused. Twins, Superior, Premium and 4-Poster bedrooms are available. Nearby attractions and places of interest include Brampton Park Golf Club, Hamerton Zoo, the Reptile Foundation and Leo's Funzone.